Cardano Approaches Major Shelley Upgrade + Bitcoin Hashrate + Daily Token PricessteemCreated with Sketch. Today we have three cool news segments to share as part of our Daily News for the Day Segment. First up is Cardano. Cardano has released version 1.5 today, which is an important step towards the Shelley Release, which will introduce the Ouroboros BFT consensus Protocol and transform the token into a Proof of stake token. Then we have the Bitcoin Hash Rate which has hit its 4 month high, which is fantastic news for miners are there is more opportunity for cryptocurrency mining and receiving the Block reward. 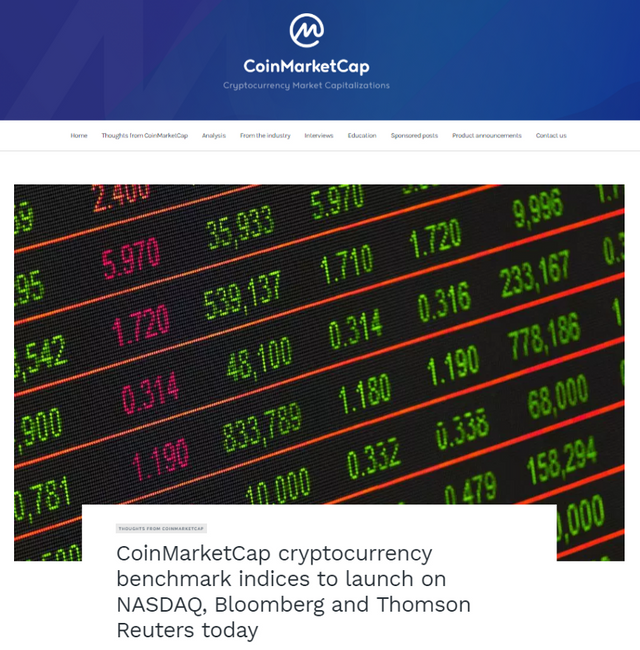 And finally, Coinmarketcap's cryptocurrency indices have launched on Nasdaq, Bloomberg, and Reuters. Before you dive straight into the news, if you guys are interested and would love to keep updated with our daily videos, please make sure you hit the like and subscribe button. 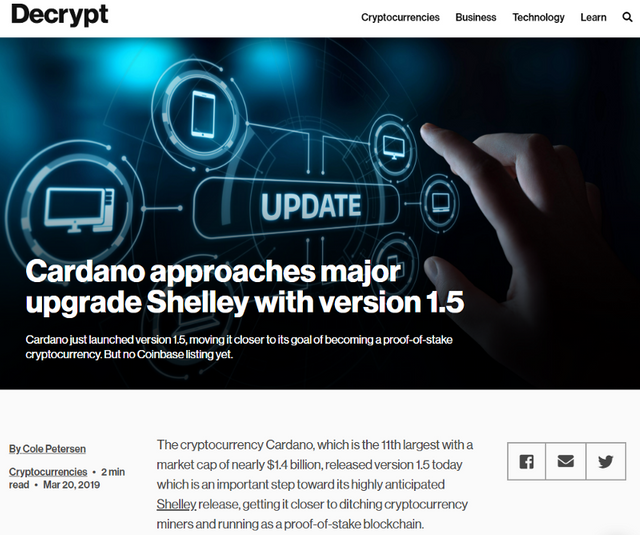 According to Decrypt, Cardano 1.5, the latest version, has introduced a number of new changes. The idea of this upgrade was to transition over from its current state known as Byron into Shelley. It's definitely an event that has got many fans waiting anxiously at their feet. One of the most important aspects about the Shelley upgrade is the new consensus protocol "Ouroboros BFT." Not only will this enable Cardano to switch to a proof of stake blockchain but it is a great way to guard against 51% attacks. On top of this, Version 1.5 has introduced a number of other new changes such as UX changes and providing better information about the amount of disk space required to run a Cardano node. While Cardano is making improvements, the cryptocurrency token is, however, still not listed on Coinbase yet. While it's seen as a potential cryptocurrency, I believe that if Cardano can be listed, we would probably see a big boost in the price and value of the token. For some context, Cardano is the 11th largest cryptocurrency token with a market cap of almost $1.4 billion. Here's hoping that they will continue to progress well into the future. Second, is the Bitcoin Hash Rate. 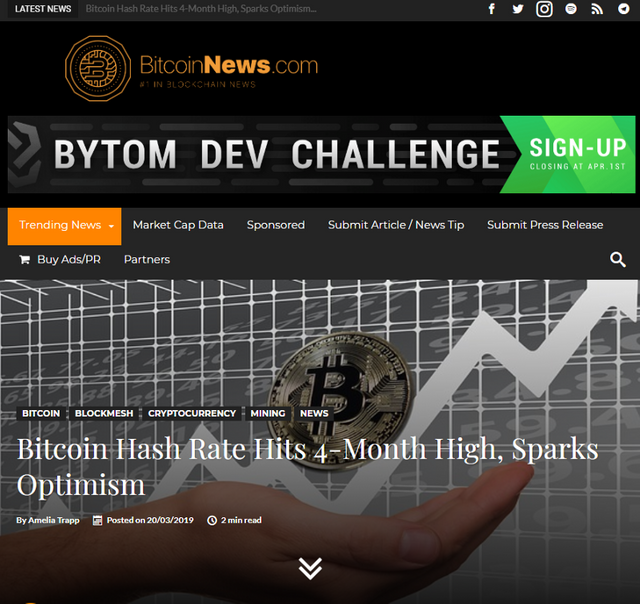 According to BitcoinNews.Com, the Bitcoin hashrate has reached the highest levels since November 2018. What does this mean? So the hashrate is the measure of the miner's performance, the speed at which a miner solves the Bitcoin code. Here, the higher hash rate means increased opportunity for cryptocurrency mining and receiving block reward. On Tuesday, March 19, the Bitcoin has rate surpassed 52 quintillion hashes per second, giving new miners an easier time bringing their rigs online. This is fantastic news for the industry as it shows that there is more confidence in the network's future, as we will begin to see more resources invested in mining operations. This is a stark contrast to the concerning low hash rate levels and price plummets in 2018. And finally, let's look at CoinMarketCap. 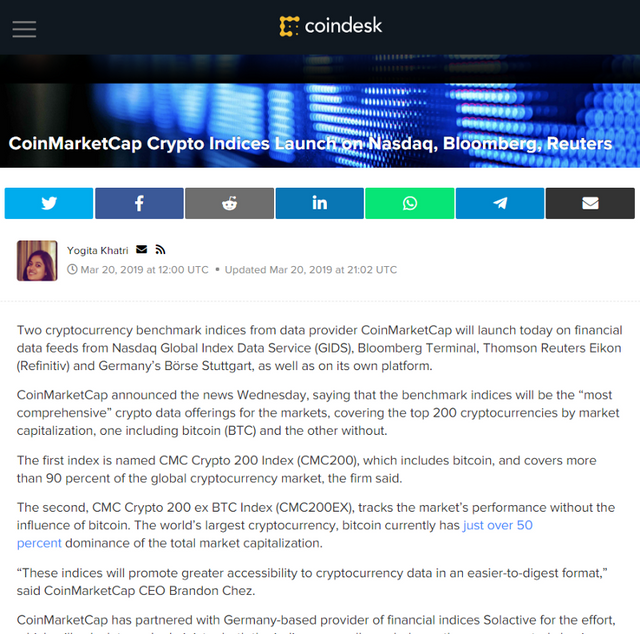 According to CoinDesk, two cryptocurrency benchmark indices from CoinMarketCap will launch on the financial data feeds of prominent companies, these include the Nasdaq Global Index Data Service, Bloomberg Terminal, Thomson Reuters Eikon and Germany's Borse Stuttgart. Coinmarketcap mentioned on Wednesday that the benchmark indices will be the most comprehensive cryptocurrency data offerings for the market and that they are covering the top 200 cryptocurrency tokens. Once again fantastic news for the space. As Brandon Chez. the CEO of CoinMarketCap mentioned, "These indices will promote greater accessibility to cryptocurrency data in an easier-to-digest format." To wrap things up, when it comes to the market today, we've got a pretty stable top 10 market, Bitcoin Ethereum and XRP experiencing an increase in 0.65%, 0.63%, and 0.73% respectively. We notice there is a 2.23% drop in the Binance Coin and 1.37 drop in Stellar. As for the top 20, we've got some really interesting gains here. Cardano shoots up 3.07% increase. But in 17th place Ontology increased by 16.66%. Just out of the top 20 is Tezos who has also increased by 10.36%. So returning back to the news, what are your thoughts on the situation guys? Are you excited for Cardano to release the Shelley upgrade soon? Do you think the higher hash rate may lead to higher prices in the Bitcoin? And do you think CoinMarketCap's cryptocurrency benchmark indices on Nasdaq, Bloomberg, and Reuters are going to lead to greater accessibility to the crypto market? Please join us at our Telegram Group and follow us. Disclaimer: Cryptopig content is written by a team of blockchain passionate people. We are not registered as investment advisors. Don’t take the information in this post as investment advice and make sure you do your own research before investing. Cryptocurrencies are a very risky investment, never invest more money than you can afford to lose.